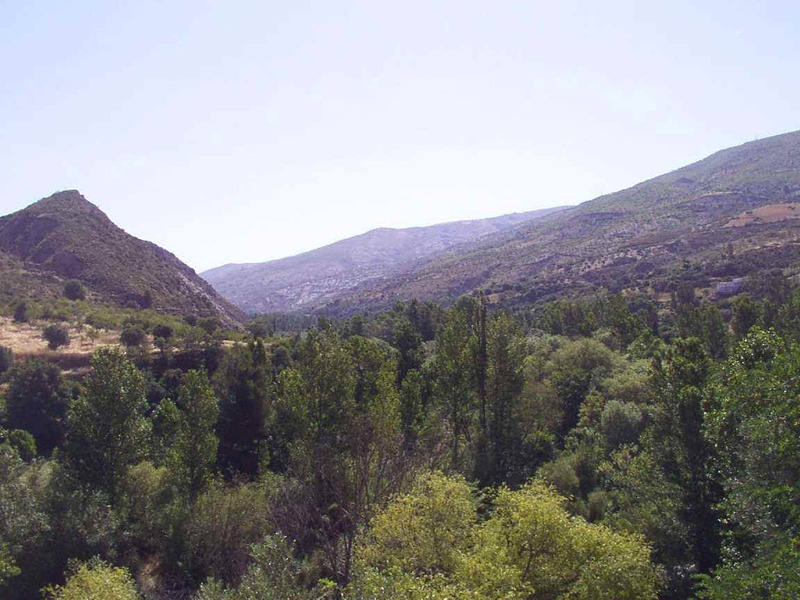 Spain, Alpujarras ethical accommodation - ecotourism responsible travel / tourism. Ecotours, ecoholidays - ethicalescape! the property: Our cottage is not isolated or secluded. 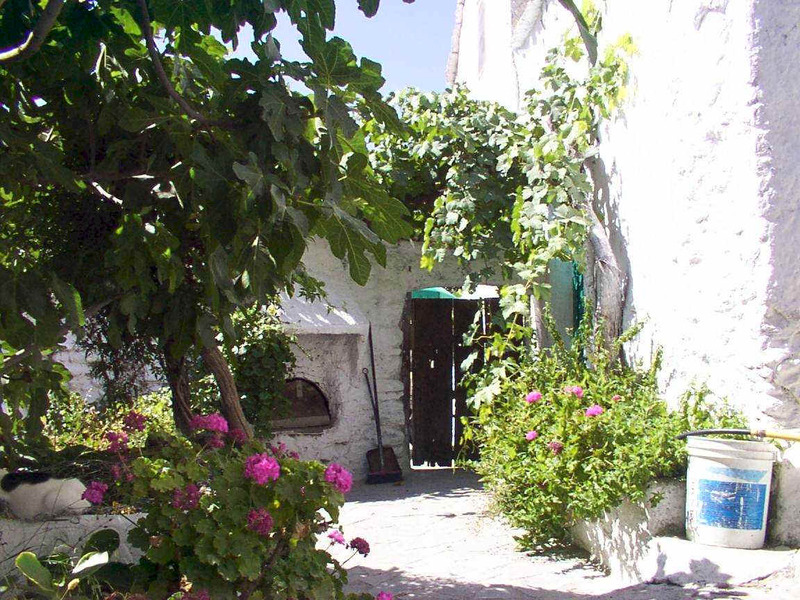 It is part of a small traditional agricultural community in the Alpujarras region, near Granada. Puerto Juviley is a hamlet consisting of 15 farmhouses and a church, with no shops or bars and no concessions to tourism. It is in a beautiful unspoilt valley. Lots of animals live near the river: wild boar, ibex, eagles, foxes, vultures, turtles. The sound of the gently burbling stream competes with birdsong and rippling leaves.We are only 1km from the main road, but it is like a different world. However it is only 40 minutes to the beach, an hour to the city of Granada. El Parador (de Nuestra señora del Rosario) is part of an old inn and apart from the addition of a basic kitchen and bathroom, the cottage retains all the original features.It is not luxurious, but it is comfortable and reasonably priced. It’s ideal as a base for rural tourism and we welcome families with children.You will meet Spanish people and may get involved in village life. 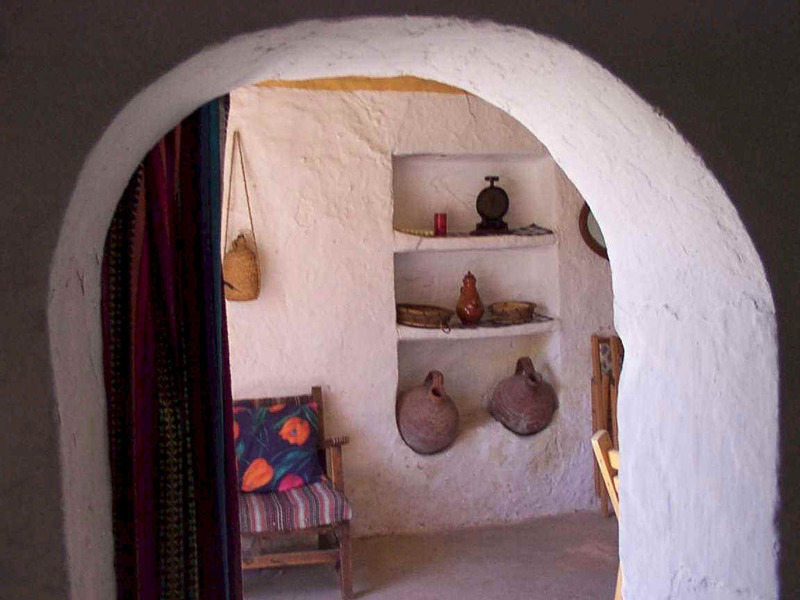 accommodation: The cottage was built with stones and earth, plaster, wood, bamboo and clay which were all sourced in the valley. The walls are whitewashed and some rooms still have the original lime plaster floors.We have added a kitchen and bathroom using cement and tiles, as well as bamboo and poplar beams. On the first floor there are three interconnecting bedrooms, with two double beds, two single beds and a cot, which can be arranged to suit our guests. The ground floor has an entrance hall, staircase, living and dining room (with open fire), kitchen with fridge (gas), cooker (gas), the usual basic cooking equipment, bathroom with hot and cold water, flush toilet, wash basin, bath and bidet. Water is piped from a mountain stream and is not chlorinated, so drinking water is drawn freshly from a spring. There is a large covered balcony upstairs with a wonderful view up the valley and a small private patio with an old fashioned sink for clothes washing and a washing line, together with a table, chairs and sun umbrella. The house is lit by solar power, converted to 220 volts, so that mobile phonesand laptops can be charged. Radio cassettes are OK, but more powerful appliances such as hairdryers cannot be used.In winter, candles provide romantic extra lighting and there is a log fire, together with portable gas heaters. The cottage is cleaned before and after your stay, not while you are there. We provide bed linen and towels and clean ones will be supplied once a week or as necessary. We expect you to bring your own beach towels. We can supply a coolbox and sun umbrella. pets:We never invite any animals in any of our houses as I am allergic to cats and dogs, and so, sorry, we cannot allow pets. access:There are no roads in the village. Cars are parked down by the river and it is a short walk(2mins) up to the house. Please note that the house is not suitable for those who have problems with walking. transport: We are about an hour from Granada and forty minutes to the coast.The airport at Granada is about an hour away, Málaga two hours and Almería three hours. Our local shopping village is Torvizcón (10 mins) and the town of Órgiva, which has many alternative and international amenities is just 15 minutes by bus or car.The coastal towns of Motríl and Salobreña (40mins) have large supermarkets. There are 3 buses a day to Granada and 3 returning which stop at the top of the track. It is possible to stay at the cottage without a hired car, especially if you are bringing bicycles. But please bear in mind that you will spend a lot of your holiday waiting for buses and walking between buses, just like many local people. We do not recommend families with children using public transport, particularly in summer because of the heat.Hiring a car can cost less than 100 pounds per week, which can work out cheaper than transport to and from the airport. surroundings: We are situated in a beautiful and tranquil river valley. You can wander freely through the woods and fields and up the mountains. It is a natural playground for children, with no danger from cars.Discover nostalgic delights of making mud pies and dams in the streams! Local people are friendly and helpful and may invite you to join in their activities.In summer there are natural pools for swimming in the river, as well as public pools in Órgiva and Torvizcón. Autumn and spring are perfect for walking and cycling, and the display of wild flowers and almond blossom from late January onwards is spectacular. We can arrange a starter pack of basics such as milk, bread, tea and coffee, the ingredients for a simple pasta meal, snacks, drinks and breakfast to get you through the first night if you arrive on a late flight or on a Sunday. (We charge 5 pounds per person). If you have any special dietary requirements we can lay in supplies and you pay us when you arrive. Local produce is usually available, we will give you guidelines on how to buy fresh, organic and specialist foods in the nearby towns.Eating out is relatively cheap if you know how and where(10 euros buys a three course meal). There is often a local fiesta going on where the entertainments are generally free. We can offer classes in Spanish language and culture (please ask in advance) to help you get the most from your stay, as well as advice and help about routes and visits. Families with young children may appreciate supplies of nappies, the loan of a box of toys and books …. we can even arrange an experienced English speaking babysitter! There is also a large variety of complementary and alternative therapies available, such as massage, reflexology and aromatherapy: many practitioners speak English and will do home visits. The English owners (Cathy and John and their children Juanito (13) and Tomas (9) live nearby. They all speak good Spanish and can give you lots of help and information if required, but will otherwise be unobtrusive. They have experience of helping in a medical emergency and other holiday crises, as they have been running this holiday cottage for 17 years. The telephone number of their home can be used as an emergency contact number. (Mobile phones do not always work inside the houses). booking: We do not have a fixed changeover day, so visitors can arrive and depart on any day of the week. This allows you to take advantage of cheaper mid week flights, and to come to our house as part of a longer holiday. Out of consideration for our neighbours, and also to make it easier for you, we ask people to arrive in the hours of daylight if possible.There is no street lighting (no streets either!) so you will need torches. The price for one week is a flat 225 pounds (for the house, regardless of numbers) winter, spring, summer and autumn for up to 4 adults, and children stay free. We choose not to accommodate more than 4 adults as it can become intrusive for our neighbours and also the amenities are limited. A week is normally the minimum booking but exceptions can be made for long weekends including Spanish public holidays, however you will pay relatively more per night (e.g. a four day weekend would cost 160 pounds). 2 weeks 450 pounds, 3 weeks 675 pounds, 4 weeks 900 pounds. Wecan also offer longer lets at a discounted price during autumn and winter. In winter we have to charge extra for the use of firewood. It is a limited resource and we have to buy it in.However use of the gas fires are included in the price. Most people book well in advance especially during school holidays and half terms, but we also take last minute bookings. We usually ask for 50% to reserve the booking and then the other 50% one month before the holiday or on arrival if a late booking. We do not take a deposit against damages, we find that most people respect the house and replace any breakages. In the case of cancellation by you, the first 50% is non returnable, but the second payment may be returned at our discretion.If we are able to re-let the house we normally return the full price. To make a booking, enquire about availability, or ask any questions please email me, Cathy, at Cathyparrot2@yahoo.co.uk or telephone us on (0034) 958 34 33 07 and leave a message with your number if we are out.